I have recently had some extra time to try out new recipes. It helps to have the girls home over the summer! I made this recipe because I was busy cleaning and I did not want to shower, get all done up, and then drive to the next town to buy buns. That would take too much time out of my day. I was going to make some Italian Beef Sandwiches for dinner but I forgot to get buns. 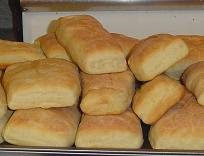 I knew I had plenty of flour and yeast so I asked myself, “Why couldn’t I make them myself?”. Homemade bread is one of my downfalls. I love the smell of homemade bread. I am however lazy in the kitchen so my family gets to eat very tasty but ugly foods. These are my very ugly but yummy homemade buns. In a bowl, dissolve yeast in 1/2 cup warm water. Add 1 tablespoon sugar; let stand for 5 minutes. Add remaining warm water and sugar. Mix in oil, salt and 4 cups flour until smooth. Stir in enough of the remaining flour to form a soft dough. Punch dough down. Turn onto a lightly floured surface; divide into equal pieces. With a knife, cut a 1/4″ deep slash across the top of each. Cover and let rise until doubled, about 20 minutes. Bake at 400F for 13-18 minutes or until golden brown. Kids love playing with dough so this would be a great one to get the kids involved with. The kids can help knead the dough and shape the buns. Those look amazing! 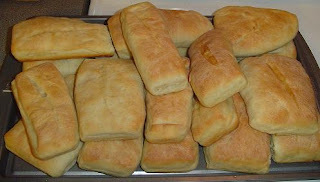 Thanks for sharing the recipe, I love making fresh bread! I don't think they look ugly at all. Look pretty darn good to me. The smell of fresh baked bread (or baking bread) just about does me in. The entire front of my shirt is covered in drool in about 3 minutes flat. I can almost smell these now.